When I first went to New York City, I was told — no, instructed – to get a cannoli. Seeing as they aren’t very popular where I live, I’d never had one but had heard so many fabulous things about this magical Italian dessert. So pretty much the second I stepped out of the airport, I was headed toward a local renowned bakery to get my first cannoli fix. And you know what? I’d heard correctly, because cannolis are awesome. I had the traditional – the crispy cannoli shell filled with the sweetened, slightly tangy ricotta cream, and topped with chocolate chips. Classic! However, there are so many different variations on these tubular treats and each one is just as delicious as the last. Whether you like yours topped with ground nuts, filled completely with chocolate or dusted lightly with powdered sugar, cannolis are a please-everyone kinda dessert. But have you tried making cannolis at home? Not a simple task. First, you need cannoli rods — metal rods that you wrap the delicate cannoli dough around so they hold that tubular shape when they’re fried. And perfecting the ricotta cream so it isn’t too tart but isn’t cloyingly sweet? I’m definitely not skilled enough to nail the ratio just yet. What I can do, however, is make a delectable Cannoli Bite! 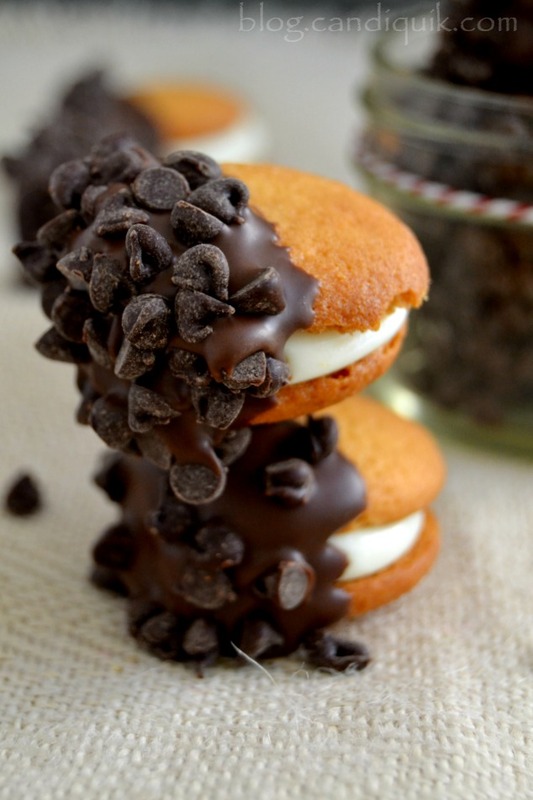 Not as traditional as your typical cannoli, but every bit as delicious in its own unique way These Cannoli Bites are little vanilla wafer cookies filled with a cream cheese filling and coated in Chocolate CandiQuik and chocolate chips for a perfect two-bite treat that satisfies those long-distance cannoli cravings. No pastry skills — or plane ticket to New York City — required! The best part? You can totally customize these two-bite wonders any way you’d like! Substitute the miniature chocolate chips for finely chopped pistachios or almonds, dip them in white chocolate for a different flavor, or fill with a chocolate cream instead. These two-bite treats taste just like cannolis without all the hard prep work of making those decadent Italian pastries. Feel free to customize each Cannoli Bite to your liking by topping with chopped nuts, dried fruit, or using different CandiQuik for a whole new take on these unique treats! Line a baking sheet with foil and spread the vanilla wafer cookies onto the baking sheet. Remove any broken pieces. Fill a pastry bag or resealable plastic bag with the cream cheese icing. Snip off a corner of the pastry bag and pipe a generous teaspoon or so of icing onto the flat part of a cookie; immediately sandwich with another cookie. 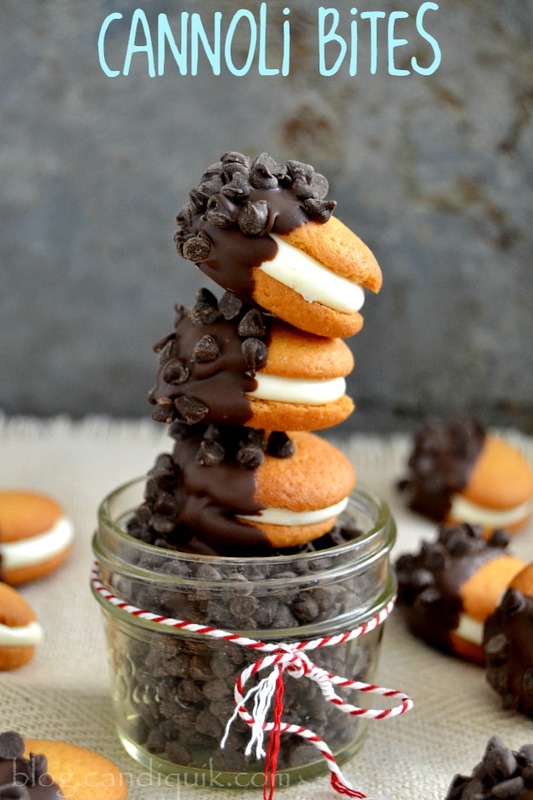 Repeat with remaining vanilla wafer cookies until you have a bunch of mini cannoli sandwiches. Freeze the cannoli sandwich bites for about 1 hour or until firm. Once chilled, melt the Chocolate CandiQuik according to package directions, or until smooth and melted. Dip each cannoli bite into the CandiQuik about halfway, then dredge or sprinkle with the mini chocolate chips. Allow the CandiQuik to set before serving. Store leftovers at room temperature for a couple days. Happy 2015! I’ve always wanted to try a cannoli, but like you, they’re not so popular here neither. I’d love to try these to see what they’re like, but I’m wondering what I could substitute the vanilla wafers for here in the UK. We don’t have those Nilla wafers. What would you suggest? Hi Lisa! Any crunchy vanilla type of cookie or biscuit would be a great substitution!